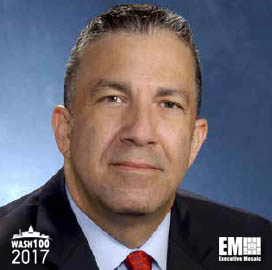 Executive Mosaic is pleased to recognize Carl D’Alessandro, president of Harris Corp.’s critical networks segment, as an inductee into the 2017 edition of the Wash100 — Executive Mosaic’s annual selection of influential leaders in the government contracting arena. DAlessandro is a two-time Wash100 inductee and 33-year Harris veteran. Harris partnered with Brocade in June 2016 to develop integrated cybersecurity service offerings, upon which D’Alessandro said the partnership would help extend his company’s expertise in the defense of customer assets beyond the government sector. The Federal Aviation Administration has chosen Harris to build five of the seven key components of the FAA’s Next Generation Air Transportation System project. “We understand the mission… We’re going from World War II technology to the modern era,” D’Alessandro told Florida Today in July interview. In late October, Harris was awarded a potential $700 million contract to help build Florida’s statewide communications infrastructure that will connect government agencies, public safety and law enforcement organizations and public schools across the state. The company will also continue to manage clinical trial data for the National Cancer Institute‘s research center as part of a five-year, $43 million follow-on contract awarded in November. Executive Mosaic congratulates Carl D’Alessandro and the Harris Corp. team for their selection to receive this award.